One of the most moving worship experiences we offer here at Manchester UMC is our annual children’s musical. It’s coming up THIS WEEKEND! I’ve asked our Children’s Music Director, Lori Borger, to give us a preview of what we can expect. Also, note that for the 8 and 9:30 a.m. service this Sunday, we’re blessed to welcome Nicki Reinhardt-Swierk, our Social Justice Coordinator, as our preacher! Ahoy, mates! This year’s musical, “The Sailor’s Bible”, shares three stories of rescue at sea: Noah’s Ark, Jonah (or, in our case, Joanie) and the Big Fish, and Paul’s Shipwreck. Written by Allen Pote and Tom Long, this musical shares a message of hope, grace, and the all-encompassing, unconditional love of God. 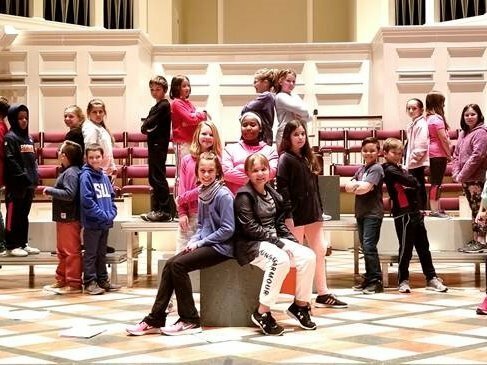 Thirty-three 4th – 6th graders and several adult musicians, assistants, and scenic artists have been working very hard for 2 months preparing this fun, engaging and powerful message for you. We’ve encountered our own storms along the way (quite literally, with snow and ice falling on our rehearsal dates!) so we’ve been living the message! Our musical, as well as our Musicians in Mission Concert, featuring our SonShine Singers and Joyful Noise choirs, are all outreach events. We are seeking financial support for our church’s Good Samaritan Fund, which provides a “lifeboat” for those facing life’s toughest storms. We hope you’ll come aboard and sail with us, and invite some friends to join you! Hard to imagine, isn’t it? We just had Christmas Eve, didn’t we? Here are 3 special things to note as we enter this sacred season. 1—“Ash & Dash.” Your pastors will be at 14380 Manchester Road on Ash Wednesday (March 6), offering a time of prayer and imposition of ashes for all who stop. We’ll do this 7-9 a.m., 11 a.m. – 1 p.m., and 4-6 p.m.
2—Ash Wednesday Service, 6:30 p.m. in the sanctuary. This very moving worship experience will include reflective music, scripture, a message from Pastor Stephanie, and time for quiet prayer. 3—Lenten small groups. We’re inviting ALL folks to join in this six-week time of spiritual growth and fellowship. Click here to read more and to register. (I’m one of the small group leaders—would love for you to sign up for my class)! Please continue to keep the delegates in prayer today, as they will be concluding their work. You can get updates from the Conference by subscribing to the Missouri Annual Conference email list, and you can also keep track through livestreaming. I want you all to know how thankful I am for the members and staff at our church. In the midst of the tragedy on Feb. 17th, when a veteran struggling with PTSD took his life, our folks responded so very compassionately. (If you didn’t read my pastoral letter regarding this last week, you can find it here.) Mike Clement (Chairperson of our Leadership Board), perhaps other MUMC staff/leaders, and I are planning to attend funeral services this Saturday in Indiana, and we will bring greetings from all of you. Please continue remembering his family and friends in your prayers.